(CNN)A day after a terrorist mowed down dozens of people celebrating Bastille Day in the coastal French city of Nice, investigators dug into the life of the man they say was the killer: A 31-year-old delivery driver and Nice resident who was born in Tunisia. Authorities said Mohamed Lahouaiej Bouhlel drove a rented, refrigerated truck weighing about 20 tons into crowds along a roughly 2-kilometer stretch of Promenade des Anglais on Thursday night, killing 84 people -- including 10 children and adolescents -- and injuring 202 others. The attack ended when police shot into the truck, killing Bouhlel, French prosecutor François Molins said Friday. Of the injured, 52 were in critical condition, and 25 were in a coma, Molins said. President Francois Hollande described the most seriously injured as being "between life and death." Staff at the Lenval Hospital in Nice said 28 children remained hospitalized. Hollande, addressing his country following its third major terrorist attack in 18 months, described the assault as an "unspeakable act" and vowed that France would "be able to overcome all trials." "We have an enemy who is going to continue to strike all the people, all the countries who have freedom as a fundamental value," Hollande said. Bouhlel was identified by fingerprints after his identification card was found in the truck, Molins said. Authorities began searching an apartment building where Bouhlel apparently lived, and Molins said Bouhlel's ex-wife had been detained. No group has claimed responsibility for the attack, and authorities did not release information about a motive. Interior Minister Bernard Cazeneuve said that so far, the investigation has not uncovered any evidence of jihadism. But Molins said the attack fits with calls that "terrorist organizations regularly give out on their videos and elsewhere." Bouhlel was known to police because of allegations of threats, violence and thefts over the last six years, and he was given a suspended six-month prison sentence this year after being convicted of violence with a weapon, Molins said. Bouhlel's father, who lives in Tunisia, has revealed that his son showed signs of mental health issues -- having had multiple nervous breakdowns and volatile behavior, said CNN terrorism analyst Paul Cruickshank. The man was "entirely unknown by the intelligence services, whether nationally or locally," Molins said. "He had never been the subject of any kind of file or indication of radicalization," Molins said. The attack was launched on a popular street that would normally be packed with tourists and residents on a sunny afternoon in July. But on Friday, screens blocked off more than a mile of the famous boulevard along the Mediterranean as authorities removed bodies and evidence from the bloody attack. Just before the carnage Thursday night, hundreds, if not thousands, had gathered on the promenade to watch a colorful display of fireworks and live music for the national holiday. But as the last firework fizzled, gunfire rang out -- authorities and witnesses say the driver shot from the cab of the truck -- and the truck accelerated down the crowded street. Bouhlel began the attack at about 10:45 p.m., driving the truck into people, Molins said. At one point, he fired a gun several times at three police officers close to a hotel, the prosecutor explained said. Officers gave chase for about 300 meters until they shot him, Molins said. The truck was rented on Monday and was supposed to have been returned Wednesday, Molins said, without saying who rented it. Surveillance video shows that about two hours before the attack Thursday, Bouhlel rode a bicycle to pick up the truck east of the city, the prosecutor said. After Bouhlel was shot, police found a handgun and some ammunition in the truck's cab, as well as a replica handgun, two replica assault rifles, a cell phone and various documents, Molins said. In the trailer was the bicycle and some empty pallets. Crews covered the dead in the street with blue sheets so emergency vehicles could both avoid running over them and spot them for evacuation. Slowly, authorities are putting names to the bodies. Four members of one family have been identified as killed, according to the mayor of the Herserange municipality in the suburbs of Longwy, where the family lived. Michael Pellegrini, 28, was a professor of economics at a private school in Longwy, in northeastern France. Pellegrini died along with his mother, Véronique Lyon, and his grandparents, Francis and Christiane Locatelli. Three Germans are among the dead, Mayor Reinhard Naumann of Berlin's Charlottenburg-Wilmersdorf district said in a statement. They were all women -- two students and a teacher from the Paula-Fürst-School. Sean Copeland, 51, and his son Brodie, 11, both of Texas, were killed in Thursday&#39;s attack, their family said. "They were just about to graduate at our school, completing the German A levels. We mourn with the parents of the school, their relatives and their friends," the statement said. "We stand with them side by side and we will provide all the necessary support that is now needed." Americans Sean Copeland, 51, and his son, Brodie, 11, of Texas also were killed in the attack, a statement from the family said. U.S. officials confirmed that at least two Americans were killed in the attack, but did not name them. Apart from those confirmed dead, three Australians, two Chinese and one British national were injured, officials said. Hollande declared a national mourning period from Saturday to Monday. France was just preparing to lift its state of emergency, which was put into place in the wake of the November terror attacks in Paris that killed 130 people, the deadliest attack in France's history. The state of emergency would have expired later this month, but Prime Minister Manuel Valls said Friday that a bill to extend it would be submitted to parliament by Tuesday. "France has been struck once again in her flesh, on the 14th of July, on the day of our national celebration," Valls said. The attacker wanted to "harm the very idea of national unity," he said, adding grimly that France will have to "learn to live with terrorism." Nice is just the latest city to be hit by a terror attack. Istanbul, Orlando, Baghdad, Brussels and Dhaka in Bangladesh are among targets hit in recent months. Twitter user Rabia Chaudry described the recent attacks as "a global, asymmetric war that can't be won." One user claimed "Je suis Nice," modifying the phrase that was adopted when staff at the French satirical magazine Charlie Hebdo were gunned down in a coordinated shooting in January 2015. Landmarks around the world were once again lit up in blue, white and red, as they were after the deadly attacks in the French capital in November. Leaders around the globe have denounced the brutal incident. According to witnesses and a blurry cell phone video, the white truck rolled purposefully toward the crowds just after the fireworks display finished. The video shows the vehicle accelerating as people scattered in front of it and a few people chased it from behind. The truck plowed through the crowds for more than a mile before police were able to intervene and fatally shoot the driver. Andy McArdy told CNN he saw the truck driving at high speed along the promenade and the driver "was firing a machine gun while driving." He said everyone ran, many into a restaurant. "They didn't know where to go, they were looking for an exit -- they were hoping they'd find an exit out the back. They had to stay there for a couple of hours, but people wouldn't even come out -- they were so frightened -- until the police came and said it was OK to come out," he said. Eric Dartell was eating at a restaurant on the street where the attack was launched. "You can see wreckage all along the way: a body, bicycles, street lamps and debris everywhere," he said. People in the French towon of Nice comfort each other after an attack taht killed at least 84 people. American Dominique Molina, who was watching from a balcony, said the fireworks had just ended and the crowd on the beach was dispersing. "People were flooding the streets, just walking away from the show, and I heard a lot of loud noises and people were screaming and so to the west, a big moving truck was driving on the promenade, just barreling over people and hitting -- running people over." She estimated the truck moved at 20 to 25 mph. Police secure an area in Nice, France, where a man carried out an attack on people, shooting at a crowd and ramming into them with a truck . A tourist from Dallas, Kristen Crouch, lamented the climate of violence that spans the globe, from her hometown to the French city, which she was visiting for a friend's wedding. "It's really sad when you've been marked safe twice on Facebook in the last week. We shouldn't live in a world like that," she said. CNN terrorism analyst Paul Cruickshank said "no country in the Western world is threatened more by jihadis and terrorism than France." "This is a big step back here. They are absolutely exhausted after a year and a half of intense efforts to try and protect this country," Cruickshank said. "The painful reality here is that if it wasn't going to be this promenade, it would have been any other promenade." France had put intense security in place for Euro 2016, the international soccer tournament that just ended. No major attacks occurred during the event. While the police response to Thursday's attack appeared to be speedy, questions are now being raised about how the man was able to breach security at the event. Interior Minister Bernard Cazeneuve said he was deploying 70 police, medical and technical specialists in order to make sure that the remains of those killed were quickly returned to the families. Hospitals in the city have launched an urgent appeal for blood donors. Are you in Nice? Did you see what happened on the Promenade des Anglais? If it's ok for you to do so, WhatsApp us on +44 7435 939 154 to share your photos, comments and video. Please tag #CNNiReport in your message. 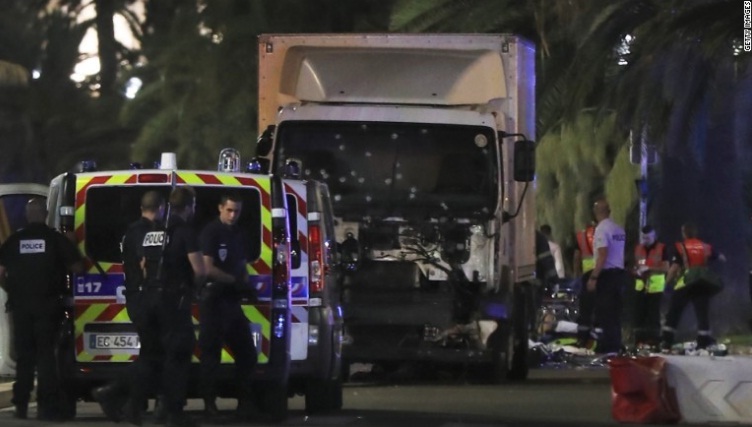 0 Response to "Attack in Nice: Truck driver identified as 31-year-old Tunisia native"